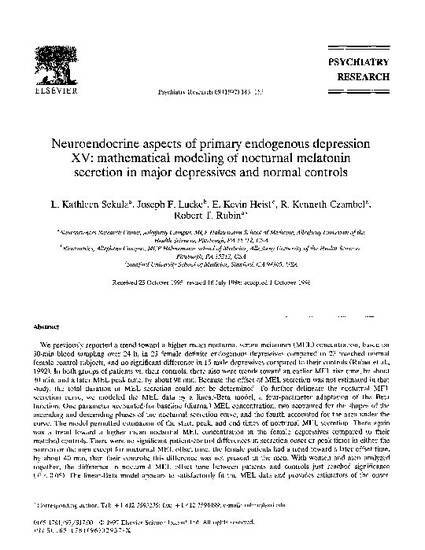 We previously reported a trend toward a higher mean nocturnal serum melatonin (MEL) concentration, based on 30-min blood sampling over 24 h, in 23 female definite endogenous depressives compared to 23 matched normal female control subjects, and no significant difference in 15 male depressives compared to their controls (Rubin et al., 1992). In both groups of patients vs. their controls, there also	were trends toward an earlier MEL rise time, by about 30 min, and a later MEL peak time, by about 90 min. Because the offset of MEL secretion was not estimated in that study, the total duration of MEL secretion could not be determined. To further delineate the nocturnal MEL secretion curve, we modeled the MEL data by a linear-Beta model, a four-parameter adaptation of the Beta function. One parameter accounted for baseline (diurnal) MEL concentration, two accounted for the shapes	of the ascending and descending phases of the nocturnal secretion	curve, and the fourth accounted for the area under the curve. The model permitted estimation of the start, peak, and end times of nocturnal MEL secretion. There again was a trend toward a higher mean nocturnal	MEL concentration in the female depressives compared to their matched controls. There were no significant patient-control differences in	secretion onset or peak times in either the women or the men except for nocturnal MEL offset time: the female patients had a trend toward a later offset time, by about 40 min, than their controls; this difference was not present in the men. With women and men analyzed together, the difference in nocturnal MEL offset time between patients and controls just reached significance (P < 0.05). The linear-Beta model appears to satisfactorily fit the MEL data and provides estimators of the onset, peak, and offset times of the activation phase of MEL secretion. This model may be applicable to more severely skewed 24-h hormone secretion curves, such as ACTH and cortisol.